Namibia is perhaps best-known as a plains game destination, and Dawid Muller has excellent concessions for the full range of Namibian species. This includes his own farm, which is a rugged, beautiful free-range area just 40 miles from Windhoek…so you can be hunting kudu and gemsbok in little more than an hour after arrival! A big difference with Daggaboy Safaris is that Dawid Muller is also an extremely experienced dangerous game hunter, operating an excellent exclusive concession in eastern Caprivi bordering Mdumo National Park. There he offers excellent hunting for elephant and some of Namibia’s rarities such as roan, sable, and red lechwe. His first love, however, is hunting buffalo—hence the name of his safari company! Dawid manages one of Namibia’s largest quotas for buffalo, with big herds coming and going from both the Park and Botswana…and bachelor bulls—dagga boys—hiding on islands and in reedbeds. 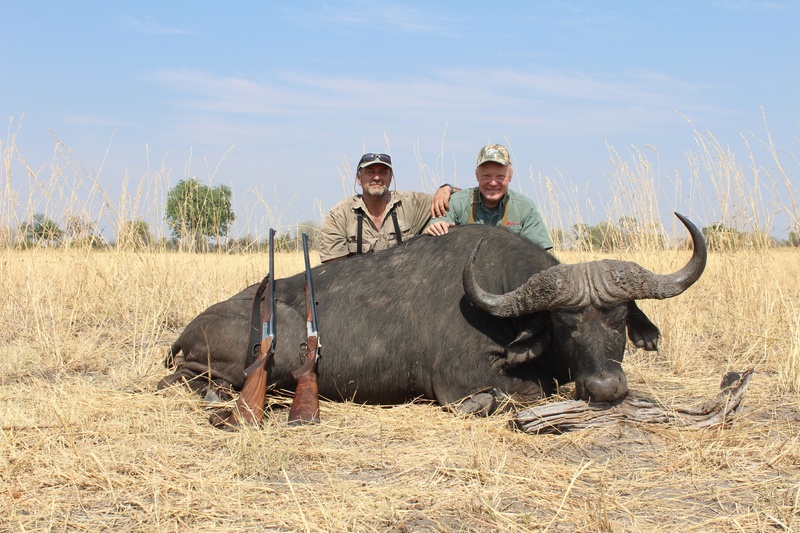 Buffalo quality is exceptional, some of the best I’ve seen…and Dawid and his team are some of the best buffalo hunters I’ve been with. Accommodations and food are excellent, “ranch style” for plains game and an excellent wilderness camp in Caprivi. In Namibia Daggaboy Hunting Safaris has it all!